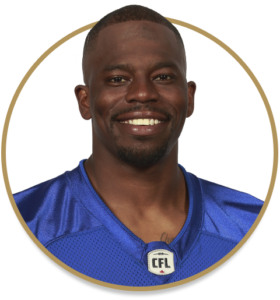 Appeared and started in all 18 games, finishing third in total defensive plays with 79 – 60 tackles, four tackles on special teams, five interceptions – one returned for a touchdown against Edmonton on September 30 – five knockdowns, two tackles for losses, one quarterback sack and pressure and one fumble recovery, also returned for a touchdown, at Ottawa on August 4… His five interceptions tied for the team lead with T.J. Heath and tied for the third most in the CFL… Named to both the CFL and CFLPA All-Star Teams… Randle was voted the Bombers Most Outstanding Defensive Player and also the team’s nominee for the prestigious Tom Pate Award. Played in 12 of 18 games in 2016, missing six in a row due to injury… Still managed to make 30 tackles and another eight on special teams. Joined the Stampeders in 2012 after a tryout with the Dallas Cowboys as an undrafted free agent in 2011… Made his CFL debut on July 1, 2012 against Montreal and his first start the following week against Toronto… Appeared in 15 games for the Stamps in 2012 and was named the team’s top rookie… Dressed for 16 games in 2013 and made 34 tackles while picking off four passes. Spent four seasons at Utah State and was a starter in his final two seasons. Appeared in 43 games, recording 154 tackles, 1.5 sacks, four interceptions and 23 pass break-ups.